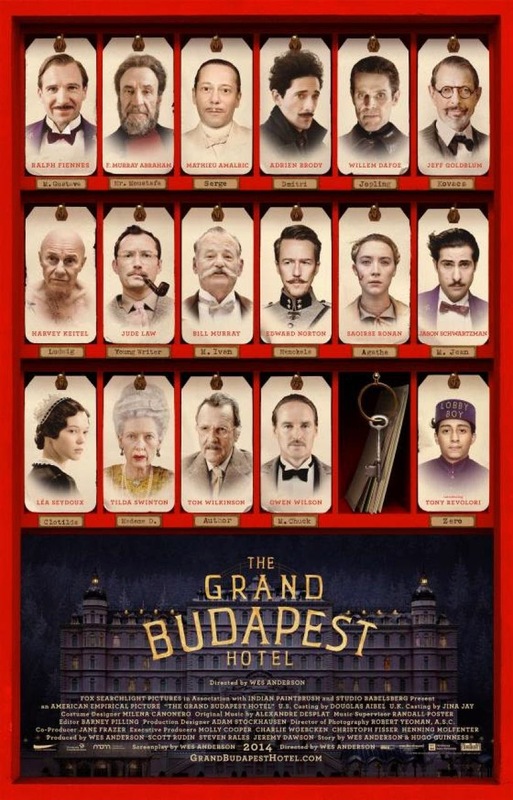 Despite the lack of talking foxes that sound like Meryl Streep and George Clooney, along with awkward teen angst, The Grand Budapest Hotel was another triumph for Wes Anderson. With a cast to kill and an array of facial hair to make even the manliest of men rage with pure jealousy, Wes Anderson creates not only a cinematic adventure but a wild ride filled with literal ups and downs that can make you cry with laughter and squirm with delight. Sitting in the packed theater of The Magnolia in Dallas, was more than pure delight as we all crept anxiously to await the screening of The Grand Budapest Hotel. The room was alive with energy that seems only the cult following of Wes Anderson could cultivate. Waiting beside those who shared the same excitement for this film only built more ecstatic energy. As the lights dimmed, the film began to roll, and a figurative "hush" spanned across its audience. As we sit there quietly, everyone on edge and focused on the screen, my friend and I noticed something. This was more than just another Anderson film. It had the underlying texture of something darker, but only a hint. As if you were haunted by translucent ghost but that ghost was your wacky, Uncle Paul who always gave you bright colored Laffy Taffy that he kept in his pockets for months on end. Just hang in there with us with this analogy, it will make sense soon enough. The Grand Budapest Hotel is your wacky, ghost Uncle Paul. With a cast that someone can only dream of, and this certain timing that only Wes Anderson can provide; his movie goers are whisked away by the incredibly , enchanting cinematography done by Robert Yeoman. Yeoman, known for his collaboration with Anderson, only added to the magic of this film. The transitions from scene to scene were flawlessly executed, with magnetic color schemes of purple, pink, and red that swiftly take you back to your wacky Uncle Paul's Laffy Taffy. Everything was in perfect order, and let us take this opportunity to discuss the actors great comedic timing. Without giving much away, the ensemble of this film worked together as a whole with such grace and elegance. As the center point, Ralph Fiennes who plays M. Gustave (a renowned concierge of The Grand Budapest Hotel and a playmate for older women with blond hair and a ton of "moolah"), executes his part perfectly, and Fiennes had the audience gasping for breath in many scenes due to his character's witty comebacks. Not only did Fiennes do well, but together, the cast made a triumph of a film. Everyone played their part so perfectly. Adrien Brody was hilarious but crude. Dafoe was frightening yet provocative. F. Murray Abraham was interesting and touching with a slight glimmer of tears in his eyes. Goldblum was intelligent, Keitel was strong, Jude Law was fascinating, Toni Revolori was sharp as the young Zero, Bill Murray was and always will be a comedic prodigy, and Tilda Swinton...well...Old. Inspired by the works of Stefan Zweig, Wes Anderson and Hugo Guinness worked wonders. With this film, Anderson and Guinness have created one of the smoothest black comedies to date. The writing was dazzling, and it certainly made this movie of an hour and thirty-nine minutes fly by. My friend and I truly didn't know it was possible to laugh and then scream in terror in the span of a measly two minutes. Actually, I did, but I'll leave my personal life out of this. This film haunted us, from the time we left the theater until this very moment and quite possibly in the future. It's not a bad haunting, it's an aesthetically beautiful haunting that decides to stick with you for a while, just like your wacky, ghost Uncle Paul. You see, you love Uncle Paul because he made you laugh, he made you cry, he scared the piss out of you, he had a pocket full of candy with bright colors, he always had something witty to say, and he had a wicked mustache. We're not going to rate this film, because it is most definitely worth going to see in the theater and immediately when it comes out on DVD. We might even purchase it on Blu-Ray and that is a commitment. So for those wondering whether or not to see this film, skip the vanilla latte at Starbucks, scrounge your couch for pocket money, and make the effort to see this heart warming film with your wacky, ghost Uncle Paul.